While there are many perks to being out in the real world and finally getting to experience "adulting," there are also some downsides as well. One of the first ones that would come to mind would be experiencing getting sick as an adult. There's just something strange about feeling down and under the weather and realizing that you don't have mom or dad there to watch over and take care of you! 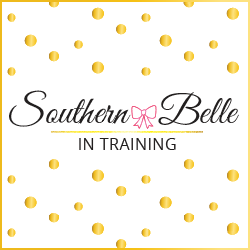 Today I'm sharing a few tips to help survive cold and flu (or mono or strep or bronchitis or... you get the drift!) season if you also live by yourself, or have moved far from your original home! 1. Brew Bigelow Tea: The Big Bang Theory is one of my favorite TV shows, and I've seen every episode of the 10 seasons so far. While there aren't many things that I agree with the main character, Sheldon Cooper, about, one thing that I definitely love that Sheldon is always quoted as saying in the show that anyone who is hurting or feeling under the weather needs to be offered a hot beverage! I definitely agree agree with this statement. I am a huge tea drinker to begin with, and I drink much more tea than coffee. I have different types of teas that I brew for different things: English Breakfast when I need caffeine in the mornings, peppermint at night, chai lattes at coffee shops, etc. 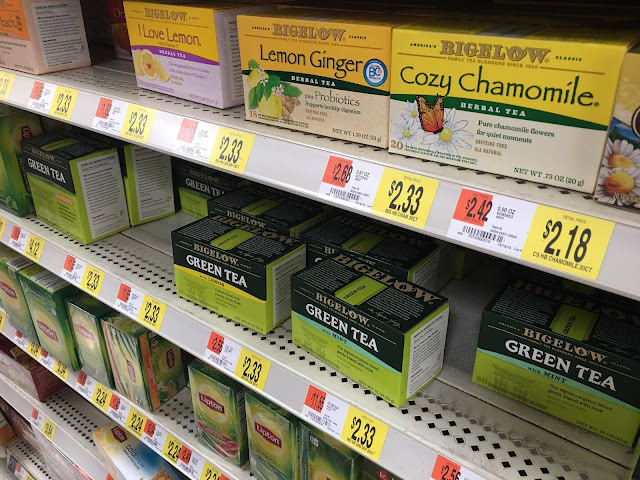 But my #1 go-to tea when I'm feeling under the weather has always been Bigelow Green Tea or Bigelow I Love Lemon Tea. 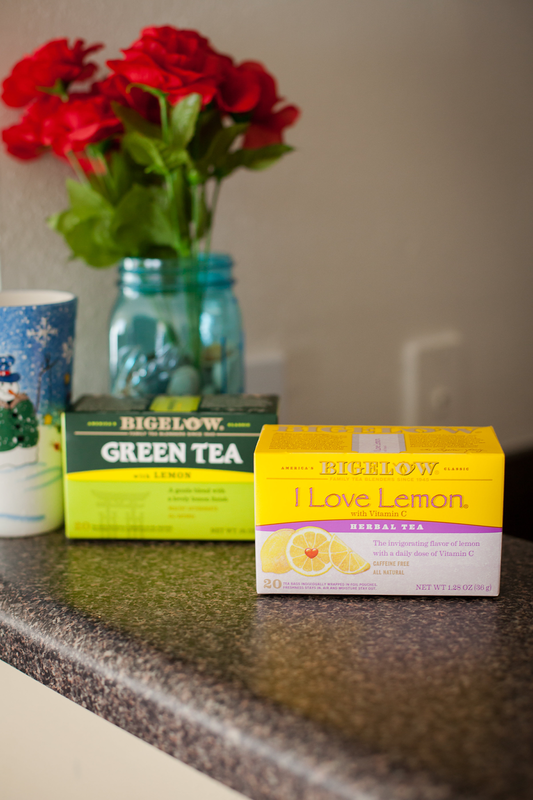 These two teas from Bigelow are the ideal choice to providing comfort when you're feeling under the weather! They really are an ideal soothing beverage. 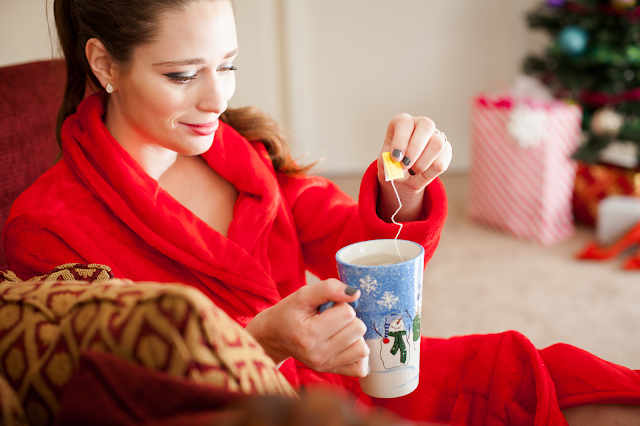 The I Love Lemon Tea also includes Vitamin C in it, which is perfect for helping your immune system. Even if I am feeling nauseous or congested, sometimes all it takes is a warm mug of tea to add a little bit of comfort to my day. 2. Take a true "sick day." Even if you have stayed home from work, school or other commitments for the day, if you're feeling under the weather, take a "true" sick day! Sometimes I am not very good at this, and I'll be the first to admit! If I have a whole day around my apartment, I'll start cleaning, doing blog work, or other tasks. But if you're not feeling well, then you deserve a whole day to truly unwind and relax. It is the best way to be on the road to recovery, as hard as it may sound! 3. Keep some sick day essentials on-hand: Sickness can hit unpredictably, and sometimes when it does you're not feeling well enough to go out and by all of the things that you need, like tissues, over the counter medicines, cough drops, and of course Bigelow Tea! It's always smart to keep a few of these things on hand during these months especially, so that way should sickness hit, you can at least be a bit prepared! Follow Bigelow Tea on Facebook and Twitter and share with them how you #TeaProudly! Stay healthy during this holiday season! Make time for self care, and take time to rest should sickness find its way to you. Thre is nothing I hate as much as being sick. 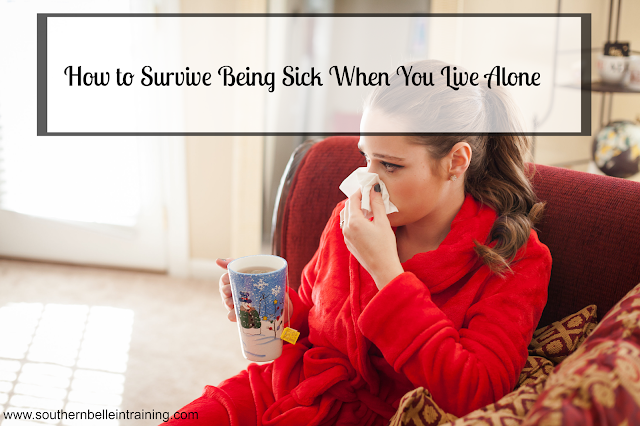 I still live with my parents, but this winter I'm going to be moving to my own apartment, so I might experience being sick without them being there to take care of me first hand! By the way, I absolutely love your mug! I love tea and I know a warm cup always makes me feel a little better when I'm under the weather! Ahh, I love Bigelow tea! And I'm right there with you - whenever I'm sick, tea is my go to. I love peppermint tea for an upset stomach and green tea for just about everything else.